Just a couple of days after WhatsApp beta for Android was spotted replacing timestamps with ASCII codes, the development team has released a new beta version that fixes the odd issue. It was found that the bug was only affecting the WhatsApp beta version 2.18.109 that was released on April 12. The bug wasn’t limiting the chat experience but was annoyingly replacing timestamps carrying “Today” and “Yesterday” with ASCII codes. WhatsApp users need to either sign up for the beta programme on Play Store or sideload the APK file. 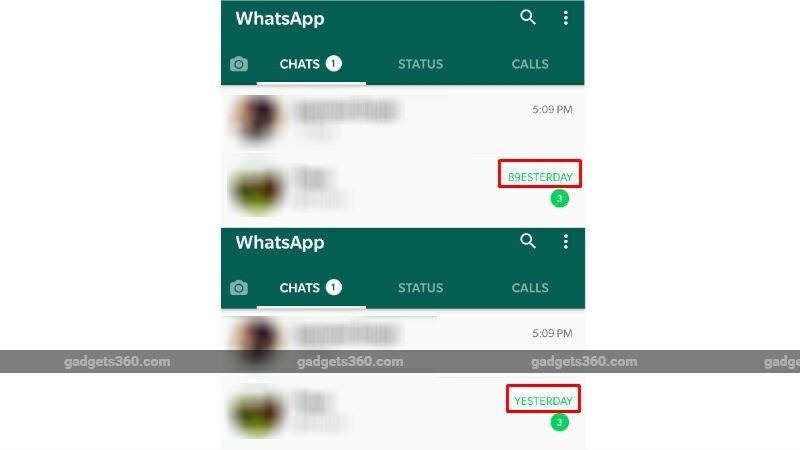 As noted by the folks at WABetaInfo, the first characters of “Today” and “Yesterday” on the WhatsApp beta version 2.18.109 were replaced by “89ESTERDAY” and “84ODAY”. It is worth noting here that the ASCII code of the alphabet T is 84 and alphabet Y is 89. Therefore, the bug was primarily changing the first alphabets of the affected timestamps with their ASCII codes. It was also all-pervasive in nature – showing the strange timestamps across WhatsApp Status, messages, and calls. The WhatsApp team apparently got to know about the bug soon after it was reported online and brought its fix on April 14, Saturday. We were able to notice the fix after installing the WhatsApp beta version 2.8.113, which was the latest build at the time of filing this story. If you’re among the users who were annoyed by the faulty timestamps, you can download the latest WhatsApp beta version on your device by visiting Google Play. You can also download its APK file directly from APK Mirror. That being said, as it is always recommended, you should avoid downloading beta version software on your devices to get a smooth user experience.